On Wings of Eagles: Remote or no Remote? Has this happened to you? We were searching for the TV remote again this week. We looked in the sofa, under the chair, behind the end table... in the kitchen. We looked everywhere. Every time we plan to watch something on TV at my house, we have to build in an extra half hour for the remote search. Show starts at 8:00 Central? If we don't want to miss the first half we have to start the hunt in Mountain Time. If the kids had the remote last, it's likely more like Pacific. The TV remote doesn't have one of those pager buttons like the cordless phone. 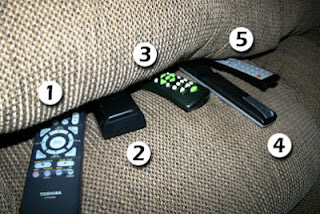 Why can't the remote simply sense that it's 10 feet or more from the TV, sprout some little mechanical legs and maneuver its way back toward the sofa? With little legs it might even be able to crawl out from the depths of the chair cushion. Or maybe we could at least push some sort of pager that would make it send out little puffs of smoke. Yeah, smoke signals. That could work. Of course, I guess we could use all the energy we spend searching for the remote to simply walk over to the TV and push the buttons on the set. No, that would be weird. It's just not our way. And you can't flick through 30 channels per second. Isn't it strange, though, that sometimes we'll take all the time looking for the remote instead of just getting up and pushing the buttons. Misdirected energies? Spiritual misdirection happens when we stop looking to the Lord for true direction. It's something to think about. In fact, the psalmist thought about it in Psalm 119:59: "I pondered the direction of my life, and I turned to follow your laws." We learn here that when we see our lives headed in the wrong direction, it's not enough just to think about it. We need to turn. Turn and follow the Lord through his word. Verse 64 says, "O LORD, your unfailing love fills the earth; teach me your decrees" (NLT). The only right direction is his direction--and to top it all off, we can know that his direction is forever and always the direction of amazing, unfailing love. Dear Lord, help us put the remote down today and come directly to You. We thank You that You are always there and never lost. In Jesus’ Name, Amen.